Walk into any modern décor shop and you’ll find dozens of new items that are artificially designed to have a vintage appearance. 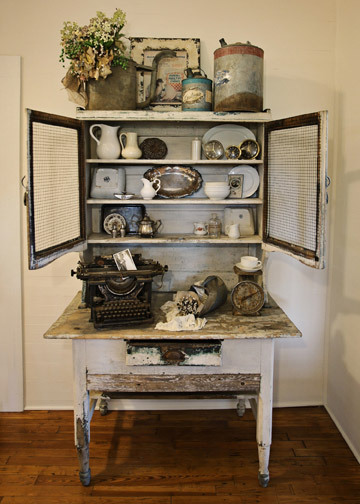 However, you won’t find any of those products in this 100-year-old farmhouse outside of Atlanta, where the homeowner was resolute in her desire to furnish the entire home using only vintage and reclaimed flea market finds. The project created a unique and exciting challenge for designer Debbie Basnett of Vintage Scout Interiors. “Not only was the goal to ensure that all of the belongings were old, but the homeowner also felt it was important for everything to feel like it had a history,” Debbie explains. In some cases, Debbie found decorative items in antique shops, such as the vintage Coca-Cola crates on the wall that now serve as shelving. She also used ladders as display pieces, mixing the vintage look of a wooden ladder with lace from a turn-of-the-century girl’s dress to give the rooms a mix of antique textures.Debbie also worked with the homeowner to breathe new life into other vintage items by repurposing them. For instance, she used a football theme to create the look of a twin bed; but instead of purchasing a new headboard, Debbie pushed the bed right up against the wall, directly under a fireplace mantel. The mantel—already built into the wall—created a self-made headboard that also allowed for storage. Since the fireplace was not in use, there was no harm done in covering it with the bed. In one of the main rooms the homeowner wanted to create a warm look, but no fireplace was there; so, she purchased a hearth and mantle and hung them on the wall. Framed in the middle of it, where a fire would be if it were a working unit, is a seasonal wreath hung for a decorative touch. 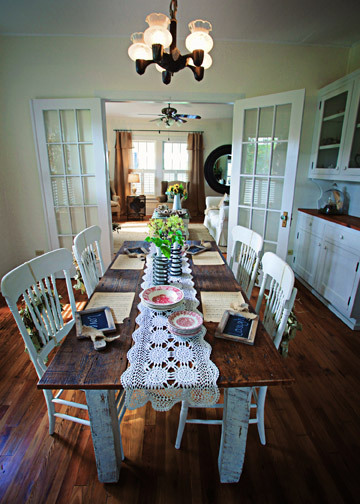 The family’s dining table is also built from reclaimed wood and is surrounded by vintage chairs that were repainted for a fresh look. Thanks to the commitment that both Debbie and the homeowner made to using flea market finds, it’s easy to imagine the house when it was first built—a fresh and clean farm with a comfortable and cozy vibe. 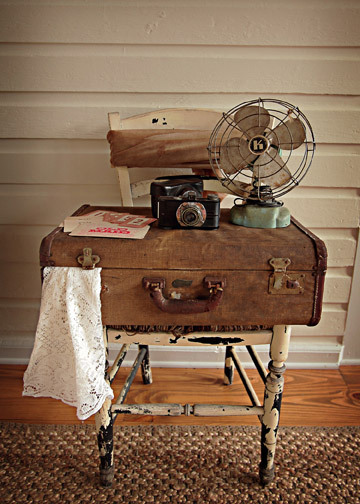 This entry was posted in Decor Inspiration and tagged dÃƒÂ©cor, Everything New is Old Again, farmhouse, flea market, flea market finds, reclaimed, repurpose, Tricialee Photography, vintage, vintage look, Vintage Scout Interiors by Flea Market Decor. Bookmark the permalink.